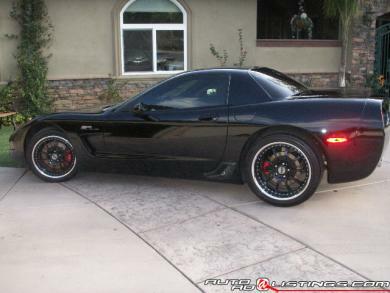 ENTHUSIEST OWNED: This 2003 Z06 has been very well maintained and cared for. Low Miles- 11,700. Non-Smoker and never even driven in the rain. Always garaged and covered. Very Clean, only one very small chip in the rear view mirror, driver side. MANY EXTRAS: Tinted windows & side lights, Kenesis 2 piece racing wheels powdered coated black w/Chrome (New $6,000), MagnaFlow exhaust system, shorty antenna, Corvette seat covers, noise reducer bulk head, power everything, heads up display, etc., etc. I have the original window sticker with all the manuels and CD & on board tire compressor. This Black Beauty really turns heads, it has a sleek look all its own. Very Fast.